May Arts can do custom printing on both the GN and HA-L series! Inquire at [email protected] for more information. 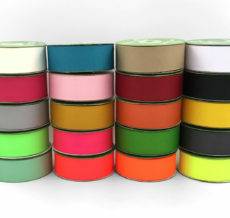 If your business has its own access to a screen printing or heat transfer industrial fabric printer, you can also buy these ribbons to make your own custom printing. 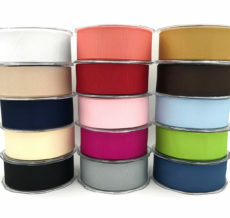 Grosgrain and double faced satin ribbons are standard ribbons for custom printing. May Arts’ cotton and canvas ribbon can also be used for stamping and doodling with copic markers and paints like in this tutorial – Stamping on Ribbon.